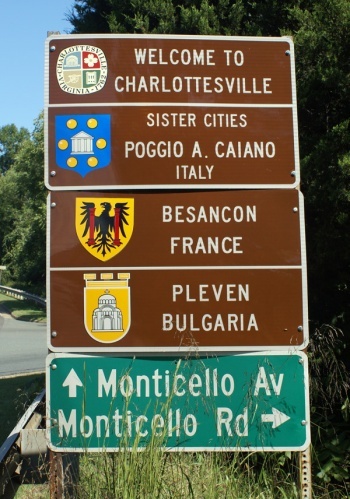 Charlottesville's sister-city program is coordinated by the Sister Cities Commission, and the city is a member of Sister Cities International..
An article on Wikipedia has information about Sister Cities International in areas beyond Albemarle County's borders. At one point, the city had a sister city relationship with Long Beach, Washington. However, that no longer seems to be the case. ↑ Web. Sister Cities Program, City of Charlottesville, retrieved 5 Oct 2009. ↑ Web. BAR Actions for March 15, 2011, Mary Joy Scala, City of Charlottesville, March 16, 2011, retrieved March 28, 2011. ↑ E-mail. Paige Barfield, City Council Clerk, City of Charlottesville. "sister cities clock?." Message to Sean Tubbs, Charlottesville Tomorrow. June 28, 2012. This page was last edited on 17 June 2017, at 18:16.